AN’s editors toured the 6th edition of The Collective Design Fair at the Skylight Clarkson North this morning. At the fair known for its creative installations, we strolled through aisles of booths occupied by design-focused galleries and site-specific creations by local designers and museums. Several, highlighted below, walk that dazzling line between art, design, and architecture. Natural Workshop by Jesse Seegers and Brook Landscape Tucked behind the show lies an ephemeral playground by Jesse Seegers surrounding a forested landscape by Brook Landscape. Seegers describes the process as “inflatable spaces I design, make the patterns for, cut out, and do physics simulations, digitally, to see what the finished design will look like.” The actualized forms are inflated by a constant stream of air that inflates three "breathing" plastic bellies. “I intentionally designed very simple forms,” explained Seegers. “This one is a standard tube, while the other two are tapered, which exaggerates the perspective.” VIP lounge by Leonidas Trampoukis and Eleni Petaloti of LOT office for architecture Though it is called the VIP lounge, founding partner of LOT and Objects of Common Interest, Leonidas Trampoukis, would describe the topography of glass blocks and slabs of acrylic his firm created as “more an installation.” Fashioned from translucent cuboids from Glass Block Warehouse Inc. and glossy umber-hued acrylic by Plaskolite, the purely decorative furnishings exude whimsical and textural vocabulary. My Reality by Crosby Studios Harry Nuriev, founder of Crosby Studios, is heavily influenced by growing up in Moscow. His Collective booth is lined by larger than life photos of his childhood apartment complex, a place he left at just 10 years old. While he practices primarily in New York City, the artist and architect draws inspiration from his formative years, in this case, the nostalgic memory of the traditional carousels of his younger years. Nuriev reinterpreted his childhood playground as a vibrant purple roundtable that spins in circles, a symbolic gesture to his formative years and inspiration. 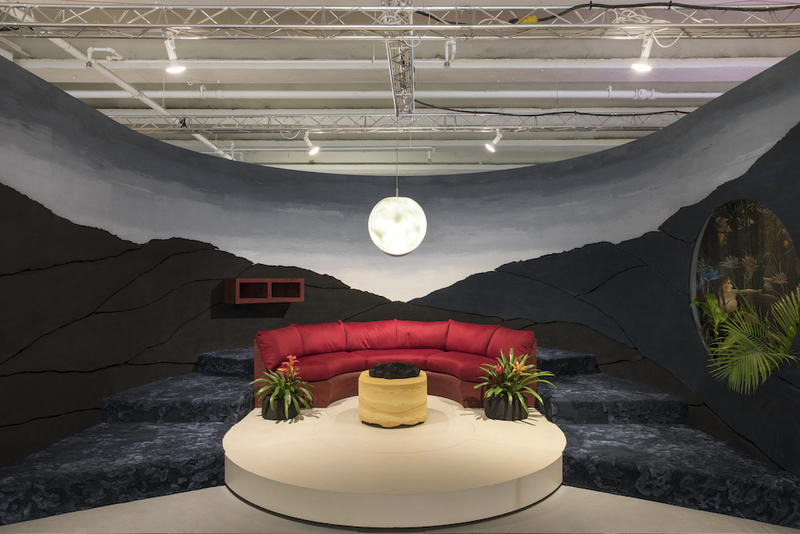 The Dream by Fernando Mastrangelo Inspired by Henri Rousseau’s painting The Dream, Fernando Mastrangelo created a sumptuous, curvilinear furniture landscape fashioned from sand molded with acrylic resin. Mastrangelo explains that the process to make wall tiles and other furniture, “as kind of like sand castle-style packing sand, only into a mold.” A surreal mountainous landscape surrounds the focal point of the space, a sand-cast sofa upholstered in oxblood cashmere, while the painting is visible through a nook in the wall, making the deep emeralds, reds, and oranges glow richly throughout the tableau. This year, Collective Design returns to New York for its sixth edition, much earlier than previous years, relocating from the May NYCxDesign itinerary to Armory Arts Week. 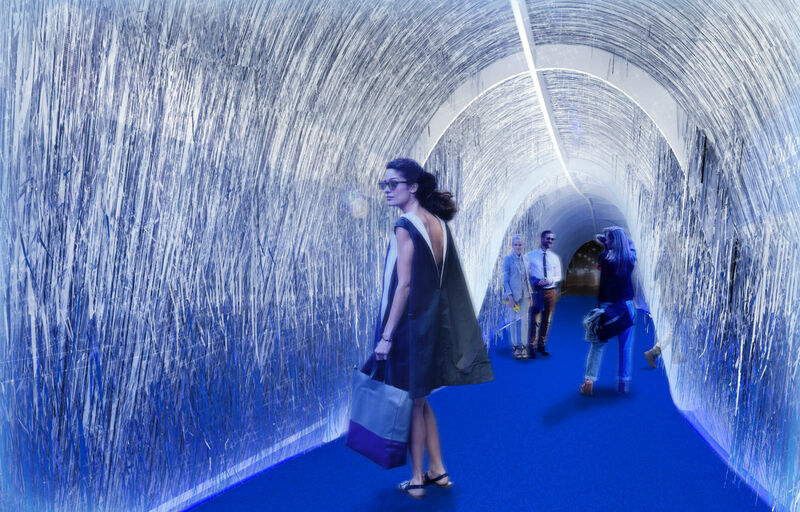 From March 9 through 11, a curated selection of design-focused galleries from around the world will occupy their booths with site-specific installations by local designers and museums. Here are five exhibitors showcasing for this year’s theme: the design process and study of objects. My Reality Crosby Studios Reminiscing on the traditional carousels of his childhood, Russian-born artist Harry Nuriev created an installation of four chairs that connect to a spinning table, like a carousel. The interactive is intentionally saturated in violet, a spectral color that occupies its own place at the end of the light spectrum. The Qualia Collection Azadeh Shladovsky The Qualia Collection was named after the word’s definition; the internal or subjective component of perception that arises from stimulating the senses. Conceptual, yet empirical, the series explores the importance of touch in visual cognition. Each piece is represented by a letter from the braille alphabet, metaphorically denoting the palpable raised dots. “Carré Rive Gauche” antiques Chahan Gallery Renaissance man Chahan Minassian—interior designer, decorator, collector, gallery owner, antique dealer, and designer—will put on view his very own found treasures: Midcentury furniture and individual works from artists he represents, straight from the heart of Paris’s prestigious Carré Rive Gauche antiques area. The lineup includes works by Brooklyn ceramicist Peter Lane, Los Angeles–based ceramic artist Antoinette Faragallah, Belgian conceptual artist Arne Quinze, and Minassian’s own designs. Mid Century Design Lost City Arts The New York–based gallery famous for its collection of Harry Bertoia works will showcase several pieces by that Italian-American artist, in addition to other postwar American Craft furniture and midcentury Danish and Italian furniture and decorative arts. Select artists include Wendell Castle, George Nakashima, Paul Evans, Louise Nevelson, and Nanna Ditzel. Moore X Odabashian Nina Johnson An ode to positive and negative space, rug company Odabashian teamed up with Miami-based artist Emmett Moore on a collection of tapestries that combine a curious amalgam of digitally altered and collaged stripes or checkers with natural materials. Each rug is embellished with a unique pattern that was derived from marble, granite, or terrazzo. Some works retain a text water- mark or digital signature that indicates the computer-aided design process. Turning mirrors into ceilings, tables into flooring, and blinds into walls, Brooklyn-based design and development firm ASH NYC isn't playing by the standard rules of workspace design. 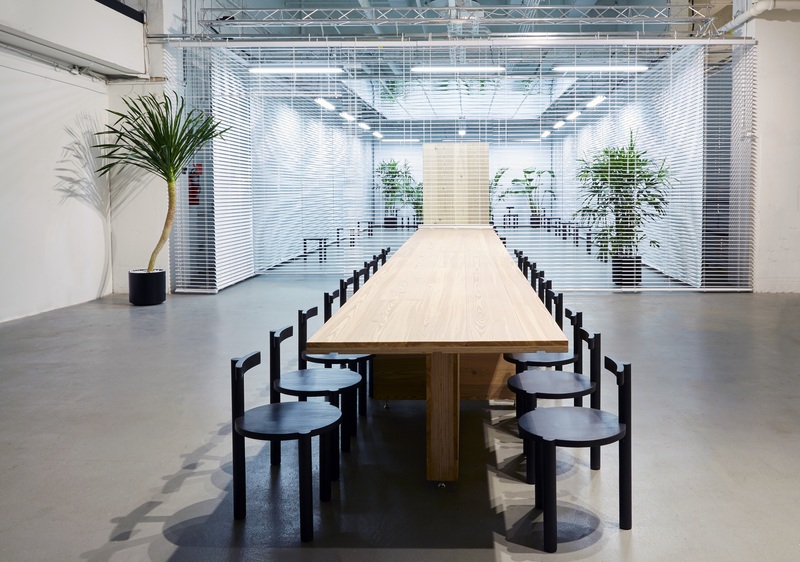 Known for mixing chic interior design and property development, the firm exhibited Office Space at this year's Collective Design held in New York earlier this month. Covering 1,250 square feet, their installation was situated in the VIP lounge and café at the fair featuring a 60 foot long modular table named Office Table that was made using reclaimed heart pinewood used for the new floors at the Whitney Museum. Connecting the lounge to the cafe within the fair, the space was encapsulated by an extensive horizontal blind system that doubled up as walls. Also tracing the space's perimeter, an array of sculptural seating cubes—or Office Chairs—offered gathering spaces for visitors to the exhibit. 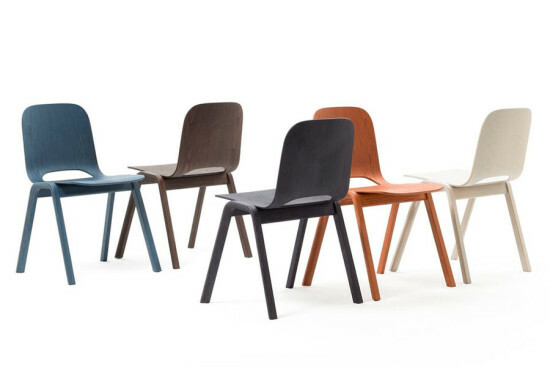 Keeping with furniture, ASH also produced a limited-edition WC4 chair that was available for purchase on-site. These chairs were interspersed within the vicinity alongside planting that offered a natural counter to the prefabricated space. A dropped ceiling was also incorporated into the design, employing ceiling panels wrapped in reflective mylar to articulate space seldom—if at all seen in office environments. Design and visual arts magazine Sight Unseen will stage a second exhibition at New York's Collective Design fair on May 4 to 8. Curated by founders Monica Khemsurov and Jill Singer, the show features work from four emerging American design firms: Bower x Studio Proba, Chris Wolston, Fort Makers, and Only Love Is Real. The latter will show, for the first time, a collection of lighting and furniture, displayed against custom wall paper by Designtex. As a go-to space for emerging trends in contemporary design, Sight Unseen's exhibition delivers on the promise implicit in its name. See below for details on each studio's presentation: Bower x Studio Proba Studio Proba and Bower teamed up to unleash Zendo, a furniture collection that draws on the themes of water, transcendence, and reflection to ensconce users in a "multi-sensory," but calm, environment. Users can listen to the gurgling Pivot fountain while lounging on the Nirvana rug, or the Waterline chair, and contemplating the meaning of life in the multicolored Water mirrors. Chris Wolston Brooklyn- and Medellin-based designer Chris Wolston combines traditional production technique with contemporary, high-tech materials. For the Collective Design fair, Wolston sand-casted aluminum foam sheeting that's typically used in architectural sound-proofing to create sculpted lighting, tables, and seating. 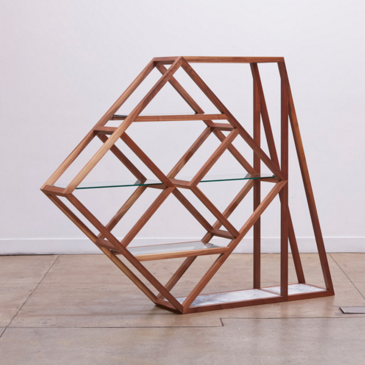 Only Love Is Real OLIR founder Matthew Morgan synthesizes the geometry of Sol LeWitt and Milo Baughman’s 1980s-era étagères to create shelving units that reference the precision of the latter with the glam but barely functional nature of the former. Every angle of his pieces is divisible by three, a comment on harmony, consistency, and structure. Fort Makers Fort Makers will showcase a new group of usable, riotously colorful, geometric sculpture. The wallpaper mural dialogues with the maple furniture, like a desk with an oval glass top and accompanying modular shelving unit. Hand-painted canvas, in the same pattern as the mural, is incorporated into square and rectangular seating units. In mid May, New York City will be over run with fairs, exhibitions, and trade shows dedicated to design and art. The big events are the International Contract Furniture Fair (ICFF) and the Frieze Art Fair, but there will be literally scores of smaller spin-off events taking place that will be of interest to the architecture community. The Architect’s Newspaper will highlight all of these events in a special May 6 issue. One exhibit and show not to miss is Collective Design’s display—for the first time in a public venue—of a 1960 Le Corbusier–designed tapestry, Les Dés Sont Jetés. This rare tapestry has been in the collection of architect Jørn Utzon, who as an early admirer of Corbu. Utzon commissioned Le Corbusier to design tapestries for the Sydney Opera House. It was at this time that Utzon bought the work for his private collection. It will be auctioned at Bruun Rasmussen Auctioneers in June in Denmark, making the 2015 fair a singular opportunity for the public to view the work. Collective Design’s 2015 fair will take place May 13–17 at Skylight Clarkson Sq, 550 Washington Street.